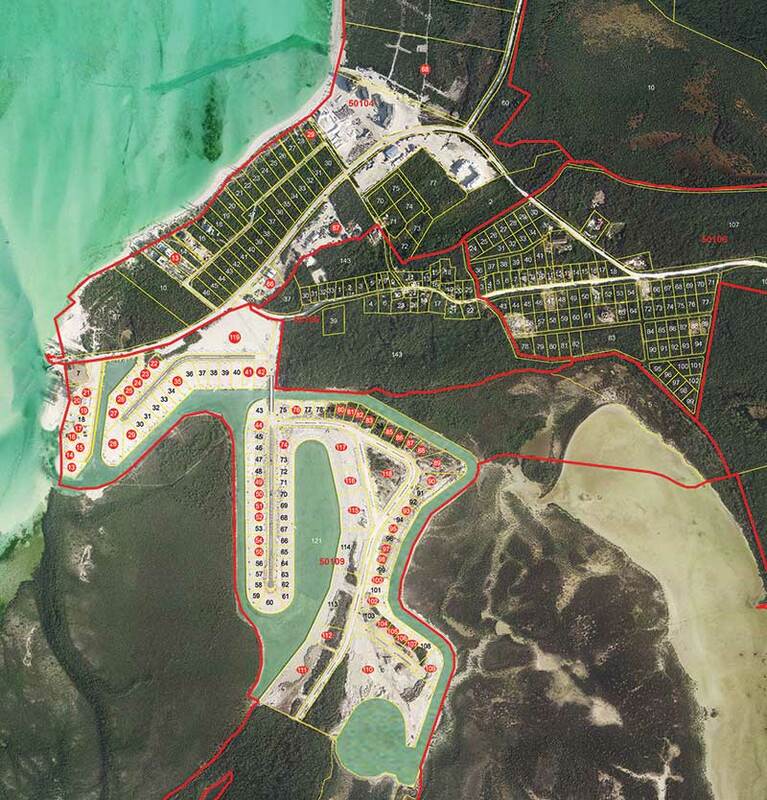 North Caicos Marina project is ready for an investor. Being a realtor isn’t always easy. It is not just a matter of answering phone calls, giving property tours, shuffling paperwork, and collecting a fat commission. For Nathan Smith, sales associate at Coldwell Banker Real Estate Turks & Caicos, it occasionally involves ferry rides, car problems, twist ties, and lots of patience and foresight. Let me explain. Nathan Smith has been the primary agent for much of the undeveloped property on North Caicos, especially lots in the Sandy Point surrounds, since the early 2000s. This includes the areas of Sandcastle Estates, Pumpkin Bluff, Seaside Estates, and the North Caicos Yacht Club and Marina. Nathan worked with the original developers of this area — Jim Gillette, Dale Piergiovanni, and W.C. Grimsley Jr. — since the group subdivided the land into plots for private homes, put amenities into place, and planned an exclusive marina community. As we reported in the Summer 2004 Times of the Islands, North Caicos was slated to become THE next island to develop, as beachfront property on Providenciales became scarce and unaffordable. The Pumpkin Bluff and Sandcastle and Seaside Estates land was prime oceanfront, with views of North Caicos’ deserted white sand beaches stretching from east to west. And, in fact, many people did buy lots, build villas, and have enjoyed the quiet, “old Caribbean” lifestyle of the “Garden Island” of North Caicos. Others purchased lots as speculation and made good profits when the market spiked between 2002 and 2008. However, after the 2008 “perfect storm” of Hurricane Ike, the global economic downturn, and alleged widespread government corruption ravaged the Turks & Caicos, real estate sales and property values, especially on North Caicos, slowly sunk. Only now, after years of disciplined governance and a renewed world economy, are prices rising again. 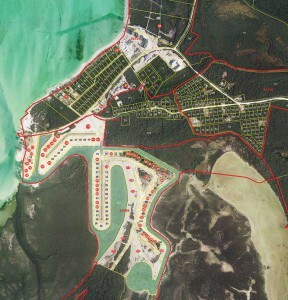 The North Caicos Marina development includes a network of lined canals and lots with utilities in place. This January (2016) I traveled to North Caicos with Nathan and his wife Sayfa to visit the North Caicos Marina development. With great plans in mind, in 2006 the 153 acre site had been subdivided, including 97 canalfront lots, with five miles of canal and the marina basin dug, roads paved, and utilities installed. Unfortunately, the project’s completion just missed the prosperity years and Nathan was able to sell about 1/3 of the residential lots, with one home built. With the area still in excellent shape and the market poised to soar, Nathan is ready to market the property again. We took the Caicos Ferry from its Leeward terminus on Providenciales directly to Sandy Point Marina in North Caicos. The trip is about 25 minutes long, and depending on the weather, either skirts the north beaches of the Caicos Cays or skims the shallow southern mangrove-lined “backside.” Arrival is always an event, with Islanders, residents, and visitors mingling with boxes of food and sundries, suitcases, beach bags, and bicycles on the dock. Although the marina is just across a small cut from the world famous celebrity hide-out of Parrot Cay, it seems light-years away. In our case, Nathan was set to drive us in the car he had recently brought over from Provo, just for showing potential clients around. Of course the battery was dead, but he was prepared with a spare and off we went after a quick jump. The first stop was at “Simply the Best” Villa, one of original Seaside Estate luxury homes. It is now for sale, and Nathan had arranged for a professional photo shoot of the property the day before. Unfortunately, the weather did not cooperate, and the photographer’s lights, props, and other pieces of equipment had to be collected from the house and brought BACK to the ferry to be returned to Provo. Job 1 for the day. Nathan’s car ran smoothly along the well-paved lanes as we drove through the North Caicos Marina site. (Well, the windows wouldn’t roll down, but the A/C was working, so who cared?) The property is sprawling, well-kept, and looks a bit like a deserted movie set. The canal is neatly lined with smooth vinyl sea walls, the ideal place to anchor a boat. Arched bridges lift the road up and over the blue-hued water, in which I spotted a sea turtle swimming. 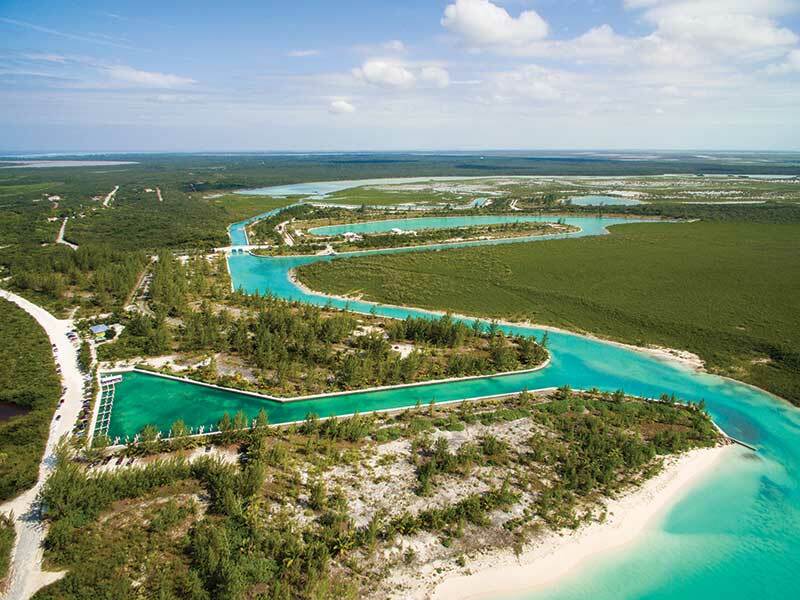 Paved central parkways are planted with flourishing palm trees, sidewalks are dotted with street lights, and many lots back into spectacular, unobstructed views of “wild” North Caicos mangrove and bush, much of which is a protected UNESCO site for migrating birds. There is also a twelve acre private lagoon. 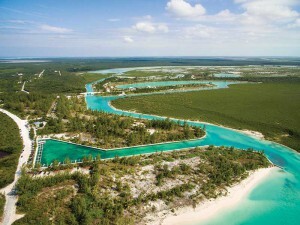 Nathan likens the opportunity to that offered by Provident Ltd. in Providenciales in the early 1960s, with early speculators enjoying tremendous appreciation rates on undeveloped beachfront, canalfront, and hillside land. Now that TCI is a proven success, the risk is small and return practically guaranteed. He explained that TCI is the perfect environment for land banking, as there are no holding taxes nor requirement to build on or maintain property. English is the primary language and the US dollar the currency. Access is easy, with connecting flights available from numerous cities. Besides, owning property gives purchasers a good reason to visit . . . and bragging rights to friends. An investment of $300,000 also makes it possible to secure a coveted Permanent Residence Certificate. As we were touring the Marina Club site the car began making strange noises. It almost seemed like there was rubble rumbling under the hood. Oh well, the engine was still running . . . except the A/C had stopped, none of the electronics worked, and it looked like something was hanging from the bottom of the engine. We carried on. Nathan showed me some of the villas and a group of vacation rental cottages that had been built over the course of the last ten years. Each was distinctive and most large and luxurious, with pools, balconies, beachfront patios, and roof-top terraces. Many are now part of an established high end vacation rental market in North Caicos. We marveled on how each yard of concrete, tile, shingle, furnishing, and fitting had to be brought to North Caicos via barge or boat and trucked to each building site. Nathan noted that there are villas and waterfront lots still available for purchase, all enjoying protective covenants for residential development. Nathan’s real estate career started in the Cayman Islands, prior to coming to the TCI in 2002 to join the Coldwell Banker team. Nathan’s style of selling has always struck me as quite savvy and “bottom line.” He markets in terms of investment value, long-term strategy, positioning, and opportunity. He follows his own advice too, admitting to speculative land purchases in both North Caicos and Providenciales as part of his portfolio. During the TCI’s slow-down, Nathan traveled to Thailand where he met his (now) wife and they lived on his farm in Australia as he made occasional trips to the Islands. Now they are back and Nathan is ready to move full-on into real estate sales here. Nathan’s final job of the day was to put up some new “For Sale” signs and use plastic ties to carefully hang his signboards below those already installed. Since the car wasn’t running, we helped him carry the signs (through the rain) to each location on foot, waiting while he used his phone to snap photos of some lots that were newly for sale. Life on North Caicos — indeed all the out islands — is like this day. Things can go wrong, break down, be delayed, disappoint. But it always seems someone is willing to help, smile, shrug, and have a good laugh. And in the end, that’s all that matters. For more information on North Caicos property, contact Nathan Smith at 649 231 5555 or email nathansmith@coldwellbankertci.com.